This weekend I made the trek to Memphis, TN to enjoy what I thought would be a great concert and time at Memphis in May’s Beale Street Music Festival. This great event happens on the first weekend of every May and a ton of different bands and musicians come to Memphis to play. When I got there though, I completely froze, and got super overwhelmed. Today on the blog I am sharing how to deal when you feel overwhelmed. This week was a bit rough for me, I had bought my ticket, but I was beginning to get comfortable with the fact that I probably wouldn’t be going because that’s all that I had. Then I got the chance to go, and I am not going to lie, when push came to shove on Saturday morning I didn’t really feel all that up to it. I went ahead (and right before me and my dad left the hotel room for the Beale Street I told him my feelings) and I cycled between getting excited about the event to not wanting to go. We got to the event when the doors were supposed to open, and low and behold, the concert was postponed due to electrical issues. So me and my dad went back to Beale Street (which was overwhelming in it’s own right with a million people wanting us to accept Jesus Christ, buy their rainboots, and buy their CDs) to get some food before the show. We ate, enjoyed Beale Street a bit, and then got back to Tom Lee Park–where people had lined up over a mile because of the delayed start. My nerves were already being tested, and I didn’t know if going in was worth it. Going in, for me, was no better unfortunately. There was so much going on, my body physically felt ill in a way. There was so much random music, way too many people harassing you to check out their vendor tents, it was muddy and slippery and I didn’t have good shoes for the park, and overall it was just not a great experience. I would love to say that I toughed it out and stuck through it, but I didn’t and I don’t feel guilty about it. Sometimes it’s cool to stick through it and learn, but sometimes it’s okay to remove yourself from a stressful situation. you don’t need to feel guilty about putting yourself and your needs first. I think the biggest thing I learned on how to deal when you are feeling overwhelmed is to listen to your body. What is your body saying to you? What does it need? Can it handle you trying to test it to make it stronger? Do you need to make your body an example right now? You can do anything you put your mind to, but you don’t always have to live outside of your comfort zone. I am a big believer in challenging yourself, but I am also a big believer in listening to yourself. You have to strike a balance between the two in my book. Don’t be afraid to sit down when your body tells you to sit, and stand when your body tells you to stand. Get out there, and if you want to stop, stop. Simple as that. I wish I could tell you some crazy awesome story about how I overcame my feelings of overwhelm to conquer the world one noisy festival at a time, but that story would be a lie. 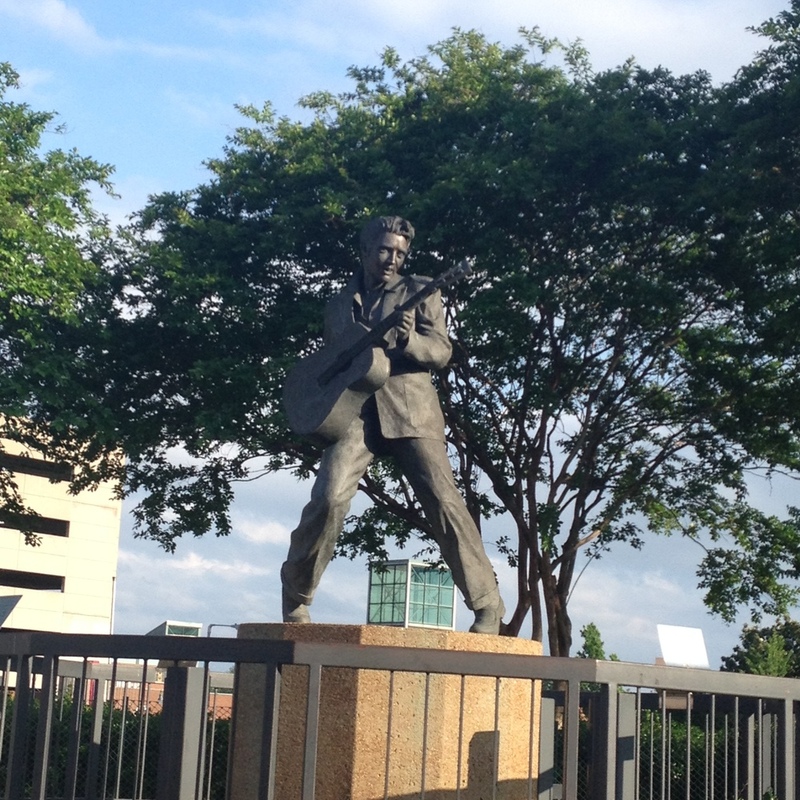 Truth is, I stayed in the blues tent for a while, before I went back to Beale Street and watched random street performances and got a picture of random Elvis statute. This is my life, and I am not perfect. Sometimes I wish I could handle large groups of people better, but sometimes it’s really hard for me to focus in that level of chaos. Know your body, know your limits, try to exceed them, but love yourself even if you can’t. Great post! I love how you say you need to challenge yourself but also listen to yourself! This is SO true! I usually get overwhelmed in social situations since I’m an introvert. They can be really hard for me since I find too much socialization to be draining. I’ve learned that it’s important to push myself to meet new people and be friendly, but I also need to realize when I’m just too exhausted by it.